An 8:30 am (!) start, in a moderate northerly under cloud, aimimg to voyage as far as we could go, tides timed to assist. 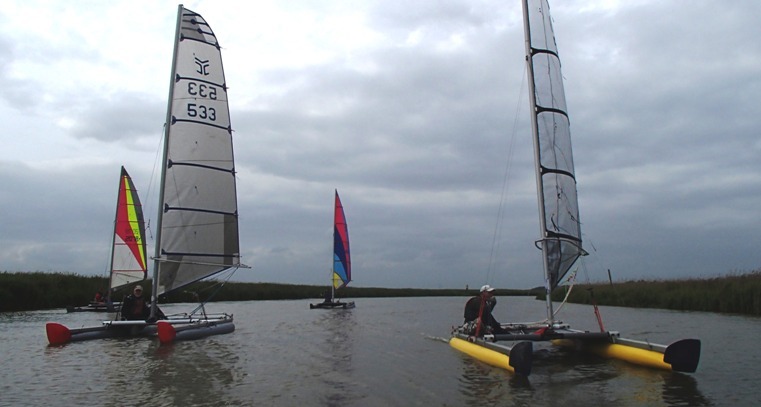 More good sailing in loose formation, down the Waveny, through the Reedham swing bridge again, and then into new water, under the high road bridge into the long straight New Cut which cuts the corner between the Waveney and the Yare. In the Waveney the tide had slackened ---but at the end of the New Cut, we were meeting the current still flooding down the Yare--- so made an easy decision to avoid this, and instead head down-stream, towards Breydon Water. 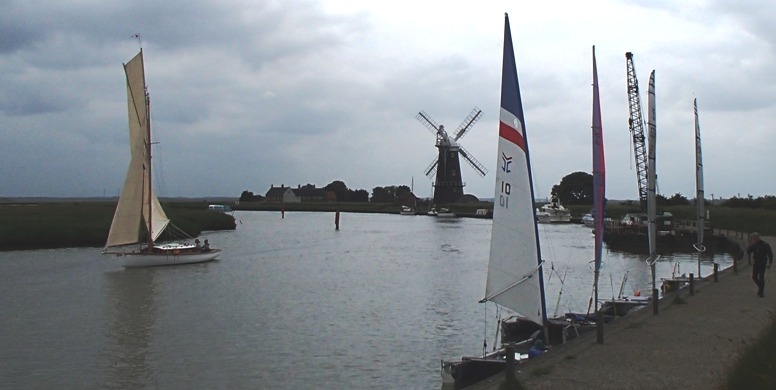 Above: smooth fast sailing down the Yare in the last of the ebb, the river widening. Below: Looking towards the entrance to Breydon Water, and a suitable place for lunch--the famous Berney Arms, in the remote marshes. Above: Looking back up the Yare from the lunch table---how traditionally Broads is that?